before the first issue was out the Happy-Acky was calling it "Madge." Oh, the horror of it all. As I recall, Russ Hodgkins and the Glendale SFL (Squires-Fox-Lewis) were with me to some extent; at least to the point of agreeing that Ackerman must limit his horrible mangling to his own work unless the authors of other material request their submissions be subject to the horrible mangling into Ackermanese. To this stupid backwardness of the chapter majority, Ackerman and his disciple conceded grudgingly. The work of getting the original equipment which has been part and parcel of the group for years, is a bit out of my category. The mimeo and over $50.00 of accessories were purchased over a period of time by Hodgkins and Morojo. I admit that I felt hurt when IMAGINATION! exploded out of my hands, but it was for the best. In any case, I can claim the dubious honour of being the founded and co-editor of the first all-Los Angeles fan magazine, and God-father to all the rest. THE GREAT DIFFERENCE between the Chapter #4 of the SFL and the present LASFS in a subject of many ramifications, the product of an evolution of some years' length, and a very interesting study. Perhaps it may be summed up in brief by the observation that the club in 1937 had no social life to speak of. The chapter centered about meetings held roughly every other Thursday. Otherwise the members contented themselves with occasional Sundaygatherings of a highly informal and unofficial nature. Often groups of three or four attended shows together or went book hunting en masse, but that was virtually the sum of it. For the most part, members saw nothing of each other between alternate Thursdays, save the vicarious mediums of post and telephone. Thus it was that when THE Thursday night rolled around, there was a lot of business to be transacted. Book and magazine trading occupied much time, discussion of the latest scientifiction magazines received prime attention, and were greeted eagerly and not with the cynicism often displayed by the present group. * The meeting itself was operated along a modified parliamentary procedure which called for reports from the Treasurer, Librarian, and the Secretary and his minutes. 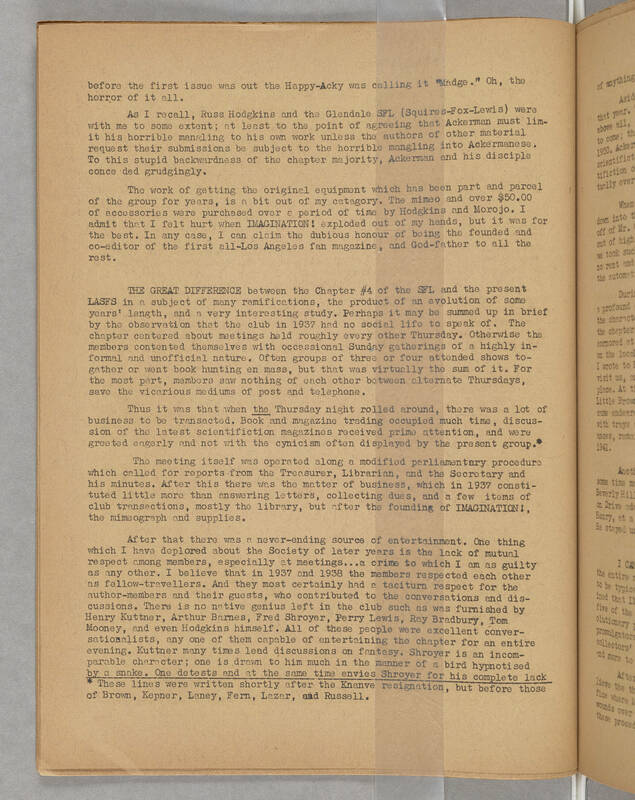 After this there was the matter of business, which in 1937 constituted little more than answering letters, collecting dues, and a few items of club transactions, mostly the library, but after the founding of IMAGINATION!, the mimeograph and supplies. After that there was a never-ending source of entertainment. One thing which I have deplored about the Society of later years is the lack of mutual respect among members, especially at meetings...a crime to which I am as guilty as any other. I believe that in 1937 and 1938 the members respected each other as fellow-travellers. And they most certainly had a taciturn respect for the author-members and their guests, who contributed to the conversations and discussions. There is no native genius left in the club such as was furnished by Henry Kuttner, Arthur Barnes, Fred Shroyer, Perry Lewis, Ray Bradbury, Tom Mooney, and even Hodgkins himself. All of these people were excellent conversationalists, any one of them capable of entertaining the chapter for an entire evening. Kuttner many times lead discussions on fantasy. Shroyer is an incomparable character; one is drawn to him much in the manner of a bird hypnotised by a snake. One detests and at the same time envies Shroyer for his complete lack ______________________________ * These lines were written shortly after the Knanve resignation, but before those of Brown, Kepner, Laney, Fern, Lazar, and Russell.